The five-voice German ensemble, Singphoniker, has been in existence for over a quarter of a century. With more than thirty CDs to their credit, their stated aim is to 'balanc[e] solo … voices in unified effort and present … a wide variety of repertoire'. The ensemble consists of Markus Geitner, counter-tenor; Daniel Schreiber, italianate tenor/alto; Henning Jensen, tenor; Michael Mantaj, bass-baritone; Christian Schmidt, bass; plus Berno Scharpf - a 'vocal percussionist'. Variety is certainly something that Singphoniker knows about: their repertoire extends from Gregorian chant to 1970s 'pop'! It is perhaps this relaxed, slightly stylish, 'off-beat' slant in the approach to the dozen sacred works by Lassus which will strike you first about this disc. True, Singphoniker's singing has precision and delicate, sinuous articulation at the same time. It has gentle expressiveness, undemonstrative projection of the faith and a rounded, open style of delivery that reacts to the texts, rather than interprets them. Singphoniker work their way through the longest piece on the CD, Vexilla regis prodeunt [tr.3]. They are, for instance, aware of the hymn's many resonances in Western liturgical music, of its many potential ways of being sung, of its inspiration and how it has inspired later settings and works. In other words the approach on this CD is an actively reflective one, rather than a pure reproduction of the world of Lassus. Although technically nothing suffers - enunciation is excellent, melodic line trenchant, textures are striking - the listener is conscious of having the music presented, rather than exploring it with the performers. This may be a by-product of Singphoniker's emphasis on accentuating individual voices as much as on the ensemble's collective sound. Evocation of moods is important for these performances although fortunately without specious effects. This is achieved by the group's awareness of the need for balance between hints at parody - the music taking from and consciously giving back to itself - and their own uninhibited enjoyment as they sing. After all, the music of Lassus is extraordinarily beautiful and rich. The hymns date from his period at the court of Duke Wilhelm V of Bavaria, from the early 1580s. They mostly take the well-established alternatim format: polyphonic strophes following monophonic ones. The scope for contrast, variety and freshness is enhanced by the tessitura of the voices used at each turn as the hymns develop. Once again Singphoniker brings grace and stature to their performances: one is never jolted from one world to the next, nor are spurious embellishments used for effect. Transitions are natural; they reinforce the progress of the musical and liturgical ideas. The works of Lassus do not emerge as 'art songs' in these performances. On the other hand they are not mere reproductions of historically-interesting manuscripts. 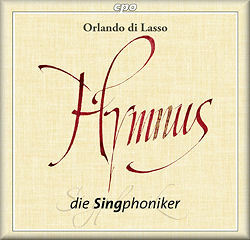 Lassus is brought to life without being over-coloured. One senses that this perception is derived as much as anything from the singers' adherence and allegiance to modern music and folk song. Their interpretations aren't quirky; Lassus is always left 'in charge'. The acoustic (Munich's Himmelfahrtskirche) is not so resonant as you might expect or at least it has not been so balanced. Maybe this is a nod in the direction of not overdoing the effects given Singphoniker's oblique approach to the music and their determination to bring as much to it as they feel they should. Clarity is uppermost. The texts are reproduced in the CD booklet - in Latin, English and German. If you don't know the wonders of Lassus, this is a quiet corner in which to start. The modern feel of the singing style makes the music close and easy. Most of these hymns are otherwise unavailable in the current catalogue. The stylish and individually colourful performances here make this a broadly welcome addition to the all too small corpus of well-recorded Lassus.